Let me start by saying I am unashamedly a Samsonite fan. There I’ve said it. Let’s face it, a travel writer’s luggage has plenty of opportunities to experience its fair share of knocks and scrapes and my Samsonites have stood up to the test. I have however longed for a cabin sized case which has a separate front pocket for tablets and laptops so you can easily extract them at security. And just like the cavalry arriving the Samsonite Ultimocabin solves this issue perfectly. 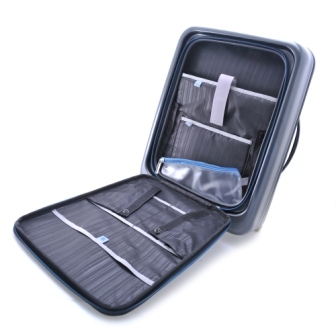 This new range of Samsonite hard cases has been specifically designed for cabin carry on use and conveniently allows you to separate your workday goods from your playday ones with an interior mesh divider pad, two separate compartments and cross ribbons to keep everything compact and in place. And the integrated combination lock provides added security. The genius part for me though is the exterior double zipped compartment section which I filled with two tablets, a laptop, accompanying cables and passport and tickets, so passing through airport security was much less stressful. 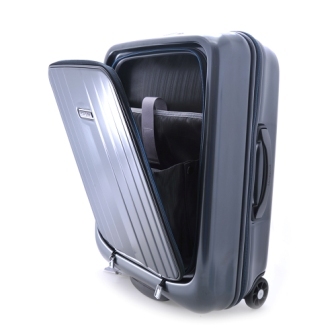 The Samsonite Ultimocabin exterior is made from Samsonite’s now legendary Curv technology which is 100% polycarbonate, (so durable it can be dropped from ridiculous heights and remain unscathed) and comes in a palette of black, silver and earth in roller, upright tote or 4 wheel spinner versions. Considering these cases are so tough they are lightweights as far as loads are concerned with my particular favourite, the Spinner 55, weighing in at just 2.9kg. 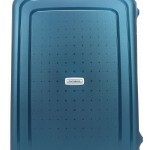 Samsonite cases are not cheap. Fact. But what you get is a product designed by a manufacturer who understands the whole concept of luggage, with durability and a lifetime guarantee so it’s a worthy investment. Now, I’m off on another case bashing trip, so bring on security, I’m well ready for you. 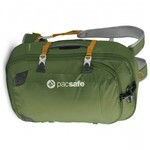 I love this Samsonite Ultimocabin review, how much does it cost? 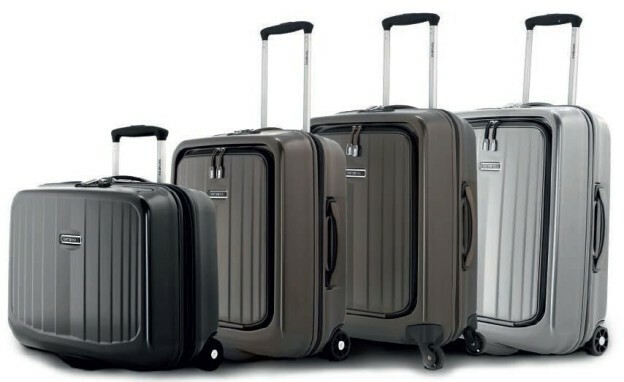 Samsonite Ultimocabin range Black, Silver and Earth.